OBJECTIVES: The aim of the study was to assess the association and correlation between the overjet and muscle activity (the masseter and temporalis muscles) in patient with Class II malocclusion in different genders using surface electromyography (sEMG). MATERIALS AND METHODS: The overjet (measured clinically) and electromyographical activity (rest, chew, post chew rest, clench and post clench rest) of the masseter and temporalis muscle of class II malocclusion patient were assessed in 18 patients (3 males and 15 females) from the School of Dental Science, Hospital University Sains Malaysia. RESULTS: The results were compared by simple linear regression test to evaluate the association between overjet and muscle activity in different genders. Class II malocclusion patients with increased overjet group showed significant association with masseter muscle activity on chewing stage (P = 0.005, F = 6.081 and adj-R2 = 0.473). Left temporalis muscle in class II malocclusion showed a significant linear association (P = 0.014, F = 0.812 and adj-R2= −0.034) with gender during clench. CONCLUSION: In conclusion, class II malocclusion patient with increased overjet can affect masticatory muscle function and as well as clench force may differ in gender. Overjet is the overlapping of the upper anterior teeth over the lowers in the horizontal plane. Specifically, the extent of horizontal (anterior–posterior) overlap of the maxillary central incisors over the mandibular central incisors. Overjet of 2–3 mm is considered normal. In class II (division I) malocclusion, the overjet is increased (more than 2–3 mm) as the maxillary central incisors are protruded. Because overjet is a very important component for diagnosing class II malocclusion, it may also have some relation with masticatory muscle. Class II malocclusion is the condition where the maxillary first molar is even with or anterior to the mandibular first molar and the buccal groove of the mandibular first molar is distal to the mesiobuccal cusp of the maxillary first molar. The distal surface of the mandibular canine is distal to the mesial surface of the maxillary canine by at least the width of a premolar. In this unusual relationship, the upper front teeth and jaw project more forward than the lower teeth and jaw. Class II malocclusions represent the most common skeletal discrepancy which orthodontists mostly treat in daily practice. However, some controversy remains regarding the treatment effects and relapse of class II malocclusion as masticatory muscles have some association with this. Most patients with class II malocclusion present with hyperactive perioral muscle with altered tongue position. Some association of masticatory muscle with class II malocclusion has also been reported. To evaluate the relationship between overjet and muscle activity electromyography has an important role. Electromyography (EMG) is well-defined for recording and studying the fundamental electrical properties of skeletal muscle by superficial or needle electrodes, which determine whether the muscle is contracting. EMG is used for diagnostic purposes in recording the electrical activity generated in muscles. Moreover, EMG plays an important role in the diagnosis of facial muscles during orthodontic treatment related to neuromuscular approach and facial pain associated with the use of functional appliances. Usually, surface EMG (sEMG) is used to assess muscle function by recording muscle activity from the surface above the muscle on the skin using a pair of electrodes. sEMG is a noninvasive investigation of the bioelectrical phenomena of muscular contraction. It adequately allows examination of important muscles involved in chewing, swallowing, and maintaining posture of the head (typically masseter, temporalis anterior and posterior, digastric anterior, sternocleidomastoid). Usually, the temporalis provides a basis for mandibular balance and postural control and the masseter is used during grinding and chewing. In dentistry, EMG is used to assess the muscles of the head and neck at rest and in function. The severity of Class II malocclusion depends on overjet, and thus is also related to masticatory muscle function. Increased overjet leads to hyperactive perioral muscle function. Modified muscle activity can help as a stimulating factor during orthodontic management. The aim of this study was to assess the association and correlation between the overjet and muscle activity (masseter and temporalis muscles) in patients, of both genders, with Class II malocclusion using sEMG. In this study, all participants provided their verbal and written informed consent. The study was approved by the Ethical Committee of the Hospital Universiti Sains Malaysia (HUSM). Letter from Human Research Ethics Committee (HREC) assigned a study protocol code USM/JEPeM/15120575. The participants of this study consisted of a total of 18 individuals (3 males and 15 females). Participants were patients referred from orthodontic clinic, School of Dental Science, HUSM. Patients with sound erupted permanent teeth (except considering 3rd molars). Patients having pathology within the maxilla or mandible. Intraoral examination was performed to detect Class II malocclusion (according to Angle's classification of malocclusion ) and measurement of overjet. Measured from the labial surface of the lower anteriors to the incisal edge of upper anteriors by using a millimeter ruler. sEMG of muscles was performed using a two-channel EMG device (MyoTrac Infiniti 2 Channel sEMG w/Rehab Suite & Continence Suite- T9855; made in Canada). It is a computerized device where the Infiniti software allows to measure high-resolution sEMG at 60 Hz. Pre-gelled and self-adhesive electrodes (Ambu Neuroline 720 Electrodes) were used. Electrode size was 30 mm × 22 mm and for single patient use only, which is best for recording sEMG in facial region. A total three surface leads were used to record muscle activity for the temporalis and masseter muscle respectively. Two of those electrodes were recording electrode and another one was reference electrode for each side. The patients were given clear instructions before the sEMG recording. For clenching, patients were instructed to clench with pressure and continuously. 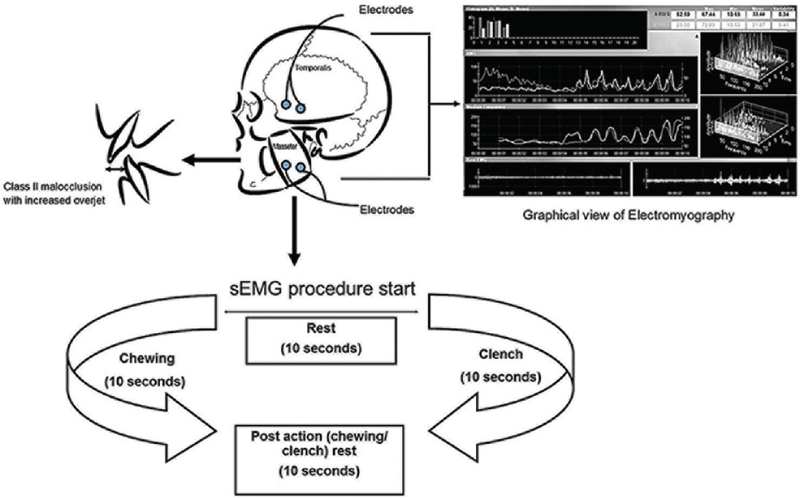 The sEMG recording was started with right temporalis muscle being at rest for 10 seconds, followed by 10 seconds of chewing on the right side and 10 seconds of rest. Again, recording was done for the left temporalis muscle being at rest for 10 seconds, followed by 10 seconds of chewing on the left side and then 10 seconds of rest. After that clenching of the right and left temporalis muscle was recorded together at rest for 10 seconds, 10 seconds of continuous clenching, ending with another 10 seconds of rest. Masseter muscle activity during chewing and clenching was recorded accordingly [Figure 1]. The data were verified and analyzed statistically using IBM SPSS Statistics Version 22.0 (Armonk, NY: IBM Corp.) with confidence level set at 5% (P < 0.05) to test for significance. Mean amplitude of the muscles (temporalis and masseter) in patients with Class II malocclusion during resting stage, left chewing stage, right chewing stage, post chew resting stage, during clenching stage, and post clench basal stage were compared with gender and overjet individually. The data were analyzed by simple linear regression test. The study duration was six months (March 2016 to August 2016). A total of 18 patients (3 males and 15 females) were selected for this study with a mean age of 20.17 years. 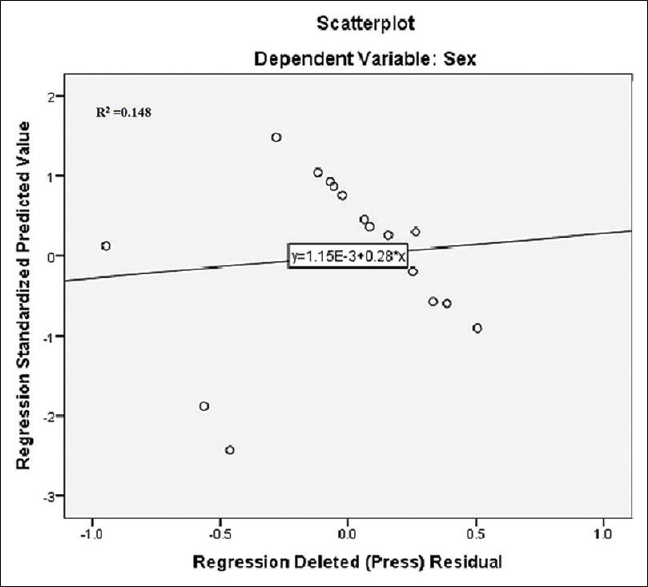 Statistical analysis using linear regression test showed no significant linear association (P > 0.05) of gender with masseter muscle (right and left) during resting, chewing, and post chew resting [Table 1]. Result showed F value = 1.115, R2 = 0.193, and adj-R2 = 0.020, which explained 19.3% of the variation in the total gender by masseter muscle on chewing. Temporalis muscle (right and left) during resting, chewing, and post chew resting showed no significant linear association (P > 0.05) with gender [Table 2]; F value = 1.403, R2 = 0.231, and adj-R2 = 0.066. It is explained 23.1% of the variation in the gender by temporalis muscle while chewing. Statistical analysis also showed no significant linear association (P > 0.05) of gender with masseter muscle (right and left) during resting, clench, and post clench resting [Table 3]. Here, F value = 1.501, R2 = 0.243 and adj-R2 = 0.081. It explained 24.3% of the variation in gender by masseter muscle on clenching. Right temporalis muscle during resting, clench, and post clench resting showed no significant linear association (P > 0.05) with gender [Table 4]. However, left temporalis muscle showed a significant linear association (P = 0.014) with gender during clench [Table 4], where, F value = 0.812, R2 = 0.148, and adj-R2 = −0.034. It explained 14.8% of the variation in the total gender by left temporalis muscle during clench on [Figure 2]. 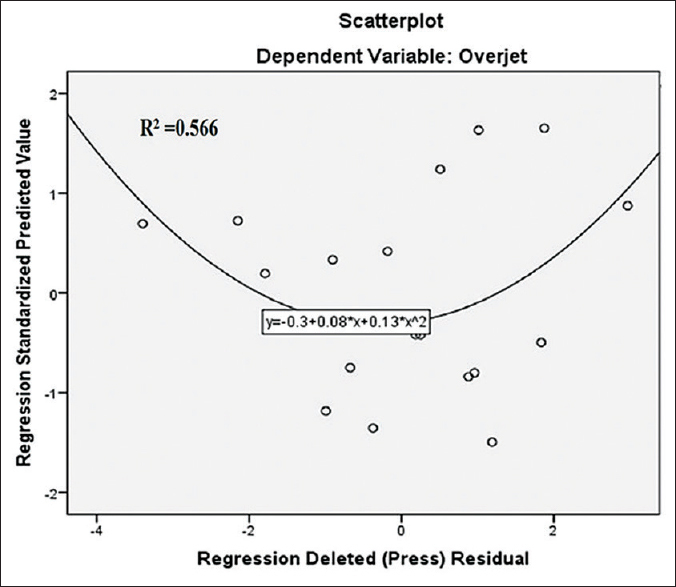 Statistical analysis of parameters using linear regression test showed a significant linear association (P = 0.005) of overjet with masseter muscle (right and left) during resting, chewing, and post chew resting [Table 5]. Result showed F value = 6.081, R2 = 0.566, and adj-R2 = 0.473 [Figure 3]. It indicates 56.6% of the variation in the total overjet by masseter muscle on chewing [Figure 4]. Temporalis muscle (right and left) during resting, chewing, and post chew resting showed no significant linear association (P > 0.05) with overjet [Table 6]. Here, F value = 1.611, R2 = 0.257, and adj-R2 = 0.097. It is explained 25.7% of the variation in the total overjet by temporalis muscle during chewing. Statistical analysis also showed no significant linear association (P > 0.05) of overjet with masseter muscle (right and left) during resting, clench, and post clench resting [Table 7]. Here, F value = 0.240 and R2 = 0.049. It is explained 4.9% of the variation in the total overjet by masseter muscle while clench. Temporalis muscle (right and left) during resting, clench, and post clench resting showed no significant linear association (P > 0.05) with overjet [Table 8]. Here, F value = 2.637, R2 = 0.361, and adj-R2 = 0.224. It explains 36.1% of the variation in the total overjet by temporalis muscle during clench. The present study was conducted to evaluate the association of overjet with masseter and temporalis muscle in class II malocclusion patients. Masseter and temporalis muscle activity were measured during rest, chewing, post chewing rest, clench and post clench rest. Usually patients with class II malocclusion show increased overjet and abnormal muscle activity. Mainly, class to malocclusion cause incompetent and short lip. This increased overjet is associated with temporomandibular joint problem. However, masticatory muscle plays an important role in TMJ movement. This overjet can indirectly affect this masticatory muscle function. The present study tried to find out the relationship or association between overjet and masticatory muscle, mainly masseter and temporalis muscles. Direct comparison of the present study with previous studies was limited because none of the previous researchers compared overjet with muscle activity. 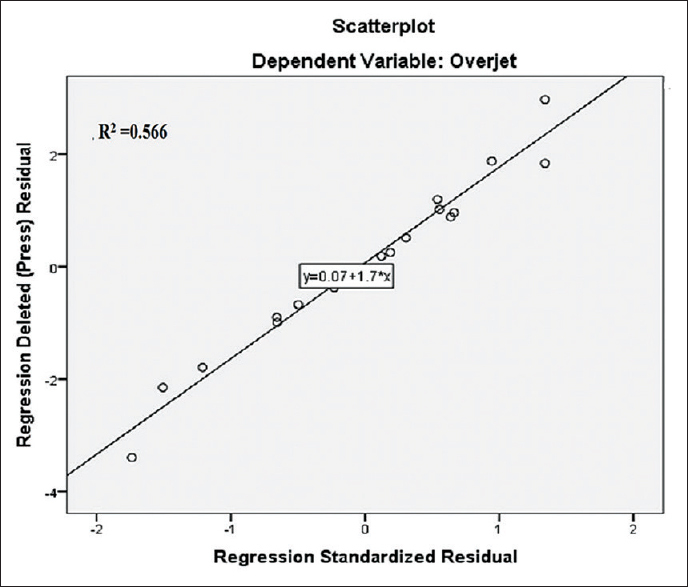 None of the study associated the relationship of overjet with masticatory muscle. The current study compared the muscle activity of masseter and temporalis with overjet in class II malocclusion patients. Class II malocclusion patient with increased overjet group showed significant association with masseter muscle activity on chewing stage, however, there were no association found in masseter on clench, temporalis during chewing, and temporalis on clench stage. Regarding gender, only left temporalis muscle showed significant association during clench. Muscle activity during clench in different age, gender, and tooth morphology can act differently. A study was conducted by Castroflorio et al. in 2005 to investigate the effect of inter electrode distance on the estimated amplitude and spectral EMG variables. He stated that it is very important to choose appropriate electrode and follow proper placement. For EMG study, muscle activity recording can be interrupt with surrounding mistakes. The present study followed anatomically electrode placement to avoid modified muscle recording. In 2008, Moreno et al. compared the electromyographic activity in between clenching, swallowing and chewing in jaw muscles. Where the result found that temporalis muscle is more active than the masseter during clench. Even though temporalis muscle exists more bite force than other jaw muscles. However, regarding chewing activity of temporalis muscle, it decreases in class II malocclusion. Present research of class II malocclusion found the same. Muscle activity increased in masseter and decrease in temporalis during chewing. According to Singh et al., there is a significant difference in muscle activity of patient between normal occlusion and various malocclusion. This indicates the association of malocclusion with muscle activity (like chewing, clench, grinding, blowing etc.). However, previous studies were concerned for muscle activity in different malocclusion in a specific position. Present study evaluated muscle activity in different position with overjet, which is an important factor of class II malocclusion. Result found a significant association of masseter muscle with increased overjet in class II malocclusion. Furthermore, EMG activity of masticatory and facial muscle revels a highly significant difference with gender. Low-level tooth-clench constantly produced fatigue sensation and maximum bite force increase muscle activity. These two situations fluctuate in gender., Present study also found an association in gender. Alam and Iida in 2013 compared the effect of overjet and overbite on anterior tooth size ratios. Result showed a significant difference in overall tooth size ratio between those with normal, increased or decreased overjet. Even in the present study, increased overjet showed a significant association with muscle function. This increased overjet may increase muscle activity than the normal. In conclusion, present study found a highly linear association of right and left masseter muscle increased activity with overjet during chewing. However, it can be speculate that class II malocclusion patient with increased overjet can affect masticatory muscle function. For gender, it showed linear association with left temporalis muscle during maximum clench. Thus, indicated clench force of class II malocclusion patient may differ in gender. USM RU grant 1001/PPSG/812154 and USM fellowship. The authors have declared that no conflict of interest. Singh G. Textbook of orthodontics. Classification of malocclusion. Chapter 14. JP Medical Ltd; 2015. pp 171-87. Iyyer B, Bhalajhi SI, Bhalajhi SI. Orthodontics: The art and science. Chapter 2. Occlusion and malocclusion, Arya (Medi) Publ; 2012. pp. 59-67. Lau JWP, Hägg U. Orthodontics: Cephalometric morphology of Chinese with Class II Division 1 malocclusion. Br Dent J 1991;86:188-90. Criswell E. Cram's introduction to surface electromyography. Chapter 1. Introduction Jones & Bartlett Publishers, City; 2010. pp. 5-7. Nishi SE, Basri R, Alam MK, Komatsu S, Komori A, Sugita Y, et al. Evaluation of Masticatory Muscles Function in Different Malocclusion Cases Using Surface Electromyography. J Hard Tissue Biol 2017;26:23-8. Ferrario VF, Sforza C, Tartaglia GM, Dellavia C. Immediate effect of a stabilization splint on masticatory muscle activity in temporomandibular disorder patients. J Oral Rehabil 2002;29:810-5. Schumann NP, Bongers K, Guntinas-Lichius O, Scholle HC. Facial muscle activation patterns in healthy male humans: A multi-channel surface EMG study. J Neurosci Methods 2010;187:120-8. Nishi SE, Basri R, Alam MK. Uses of electromyography in dentistry: An overview with meta-analysis. Eur J Dent 2016;10:419. Alam MK, Rahman SA, Basri R, Yi TTS, Si-Jie, JW, Saha S. Correction: Dental Implants-Perceiving Patients' Satisfaction in Relation to Clinical and Electromyography Study on Implant Patients. PloS one 2015;10. Suvinen TI, Kemppainen P. Review of clinical EMG studies related to muscle and occlusal factors in healthy and TMD subjects. J Oral Rehabil 2007;34:631-44. Pullinger AG, Seligman DA. Overbite and overjet characteristics of refined diagnostic groups of temporomandibular disorder patients. Am J Orthod Dentofacial Orthop 1991;100:401-15. Castroflorio T, Farina D, Bottin A, Piancino MG, Bracco P, Merletti R. Surface EMG of jaw elevator muscles: Effect of electrode location and inter-electrode distance. J Oral Rehabil 2005;32:411-7. Drost G, Stegeman DF, van Engelen BG, Zwarts MJ. Clinical applications of high-density surface EMG: A systematic review. J Electromyogr Kinesiol 2006;16:586-602. Kerstein RB. Reducing chronic masseter and temporalis muscular hyperactivity with computer-guided occlusal adjustments. Compend Contin Educ Dent 2010;31:530-4. García-Morales P, Buschang PH, Throckmorton GS, English JD. Maximum bite force, muscle efficiency and mechanical advantage in children with vertical growth patterns. Eur J Orthodont 2003;25:265-72. Leung DK, Hägg U. An electromyographic investigation of the first six months of progressive mandibular advancement of the Herbst appliance in adolescents. Angle orthod 2001;71:177-84. Uysal T, Yagci A, Kara S, Okkesim S. Influence of Pre-Orthodontic Trainer treatment on the perioral and masticatory muscles in patients with Class II division 1 malocclusion. Eur J Orthodont 2012,34:96-101. Cecilio FA, Regalo SC, Palinkas M, Issa JP, Siéssere S, Hallak JE, et al. Ageing and surface EMG activity patterns of masticatory muscles. J Oral Rehabil 2010;37:248-55. Moreno I, Sanchez T, Ardizone I, Aneiros F, Celemin A. Electromyographic comparisons between clenching, swallowing and chewing in jaw muscles with varying occlusal parameters. Med Oral Patol Oral Cir Bucal 2008;13:207. Singh S, Sandhu N, Kashyap R. A study of bite force and various variables in children segregated by angle's classification. Int J Clin Pediatr Dent 2012;5:118-23. Lindauer SJ, Gay T, Rendell J. Effect of jaw opening on masticatory muscle EMG-force characteristics. J Dent Res 1993;72:51-5. Torisu T, Wang K, Svensson P, De Laat A, Fujii H, Arendt-Nielsen L. Effects of muscle fatigue induced by low-level clenching on experimental muscle pain and resting jaw muscle activity: Gender differences. Exp Brain Res 2006;174:566-74. Alam MK, Iida J. Overjet, overbite and dental midline shift as predictors of tooth size discrepancy in a Bangladeshi population and a graphical overview of global tooth size ratios. Acta Odontolo Scand 2013;71:1520-31.